Personal trainer for individuals and couples of all genders based in Toronto, Ontario. Passionate about supporting clients to realize their strength and full potential. I am a certified Can Fit Pro Trainer and have been a personal trainer for 7 years. I have a unique approach to physical training that takes into consideration the connection between mind, body and emotions. My professional background as a social worker and therapist and my personal experience as a queer woman and new mom enhances my perspective as a personal trainer. My home gym in Toronto’s west end is an ideal place for people to work out and achieve their goals. There can be a lot of intimidation and body-shame that is often associated with fitness and gyms. I start from where the client is at to develop a practice that supports their sense of well-being and strength. I train individuals, as well as pairs and groups. I have been working out for 15 years and love many types of physical activities including weightlifting, rock climbing, running, boxing, dance and yoga. As a trainer my main areas of focus are on weight training for all skill levels, using body weight and plyometric workouts. I aim to help people gain stamina, strength and proper form. I have trained people who are just getting into fitness and working out as well as several firefighters working to pass their physical tests. I customize each workout session according to your fitness goals and any injuries you may have, aiming for every workout to be fun, motivating and a supportive push. Some of my clients train once a month, and many of my clients see me each week. Every training session is unique and my clients are drawn to my attentive, friendly, feminist approach. Find a fitness buddy or two, with similar fitness goals to train with. It can be more dynamic, uplifting and economical to train this way. Pumping iron with a friend or partner will give you that extra push you need to help keep you motivated. Check my Facebook page for upcoming outdoor group classes. I offer both beginner and more experienced classes. These pay-what-you-can workouts have a great community feel. 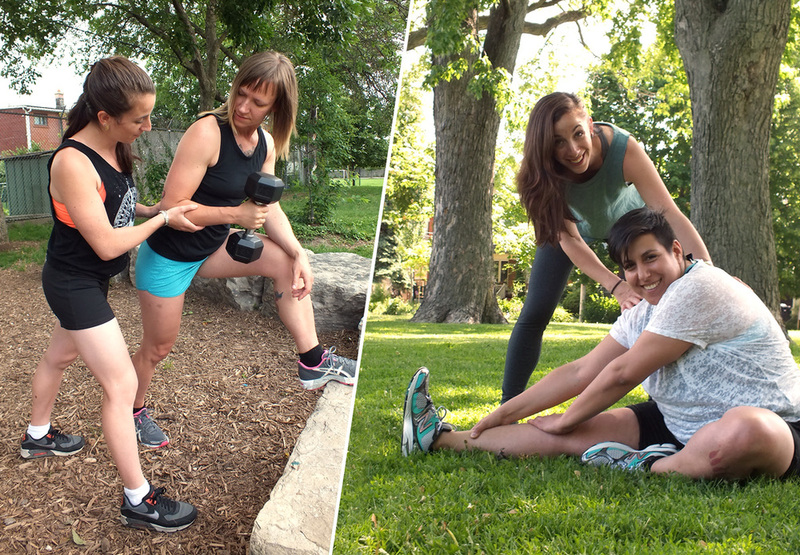 Come workout in the park, in a queer and trans positive environment! I'll be posting my own instructional fitness videos, as well as other inspirational materials I come across. Keep checking back! Note: If you would like to avoid shipping costs and can pickup your shirt, please email me directly! Questions or comments? How did you hear about me? Thanks for your interest! I’ll get back to you within the next 48 hrs.